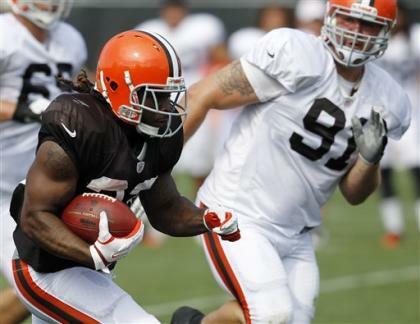 Will Browns sale impact use of rookies Branden Weeden, Trent Richardson and Josh Gordon? BEREA, Ohio – Running back Trent Richardson got a migraine just as the sale of the Cleveland Browns was being completed. In the span of a week, all the momentum the Browns had developed this offseason with an offensive reshuffling featuring Richardson, quarterback Brandon Weeden and wide receiver Josh Gordon came to a screeching halt with an even bigger makeover. Absentee owner Randy Lerner agreed Thursday to sell the franchise to Jim Haslam III for more than $1 billion. That purchase included approximately $700 million paid now and the rest due at a later date, according to a league source. While the sale may ultimately be beneficial for the Browns, who have yet to play in a Super Bowl despite being one of the league's most storied franchises, the short-term considerations may cause anxiety for some. Specifically, what does that mean for this offseason's big three and the men in charge of the trio, starting with coach Pat Shurmur? Did this season suddenly become about winning at all costs? Or can Shurmur take a step back and focus on the development of what is, presumably, the nucleus of the team's future? "I have no fear," Shurmur said regarding his future following practice Thursday. One persistent rumor, which a league source confirmed having heard Wednesday, is that former Philadelphia Eagles president and current advisor Joe Banner would help oversee the football operations for Haslam. Banner's presence could have an impact not only on Shurmur, general manager Tom Heckert (who worked with Banner in Philadelphia), Browns executive vice president Bryan Wiedmeier and president Mike Holmgren. While the circumstances could understandably impact decision-making by the current front office and head coach, Weeden won't allow himself to be distracted. "I don't even think about it because what we're doing here is hard enough," said Weeden, who is 28 and played five years of professional baseball before returning to football. "We don't need that added pressure. Stuff goes on inside these buildings that is beyond our control that we have to ignore. We have so much on our plate. … I have so much on my plate, the last thing I have to pay attention to is stuff that's outside my control." 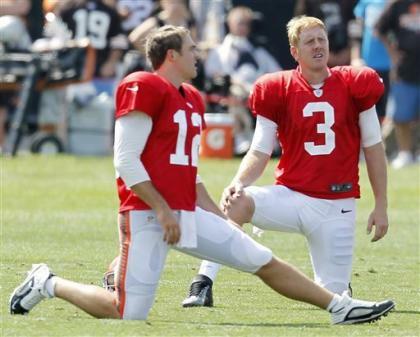 Weeden wasn't trying to be indifferent to the plight of those above him, just realistic about his role. "It's hard to listen to," he said. "I have been in professional sports before, so I understand the business side of it. I understand ownership, I know how it all works. I'm not naïve enough to not realize what is going on. But at the same time, there are a lot more important people up there making decisions. They're making decisions about me about whether I can play, but I can only worry about playing football." Conversely, linebacker Scott Fujita, who is likely playing in his final season, talked about the amped sense of "urgency" on everyone. "The urgency was already there for this team because we hadn't won a lot of games the past few years, now it's even moreso," said Fujita, 33, who wondered aloud if he and his $3.5 million salary this season would become a target for possible cost-cutting. "That sense of urgency just goes up with a new owner. "What's the mindset in terms of how we use certain guys? Do the coaches feel we have to win a certain number of games or do this or that? You wonder how it's going to play out in people's heads." In the case of Richardson, for instance, does that mean Shurmur might use him too much in an effort to save his job? That's hardly unheard of. In 2003, for instance, then-Dolphins head coach Dave Wannstedt ran Ricky Williams 392 times, including 20 times in a meaningless season finale just because Wannstedt apparently wanted to finish 10-6 to preserve his job. Richardson wasn't available to discuss the subject because of the migraine, but the situation is obvious. Or as Fujita put it, "The coaches become lab rats just like the players." The fortunate part for Weeden and the Browns is that he's had experience in steering clear of the owner. "When I was still in Tampa when I was 18, the Yankees had lost eight or nine straight," the former baseball prospect said. "We were coming back from Lakeland and had just won, but the trainer came up to us and said The Boss [George Steinbrenner] was in there working out. The trainer said, 'Look, just get your things and go. Don't shower, just go. Get your stuff and go home and shower.' The Boss was in there and he was mad." Now, before he even takes his first snap as a pro, Weeden is going from one boss to the next. What that means for the Browns today and tomorrow is a gigantic mystery. Enough to give someone a headache just thinking about it.